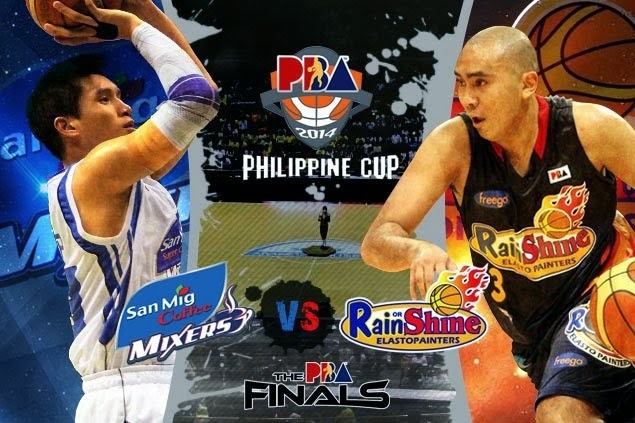 PBA Finals 2014, Rain or Shine vs. San Mig Coffee Game 2: TV Shedule, Live Stream, Preview and More - Balita Boss! The Rain or Shine Elasto Painters were able to escape Game 1 against San Mig Super Coffee Mixers, when Paul Lee made a last-second alley-oop lay-up from an inbound pass by Gabe Norwood. After suffering a heartbreaking defeat in the opening game, James Yap and the Mixers will try to bounce back against the Painters in Game 2 of the Philippine Cup Finals 2014. What time do the Rain or Shine and San Mig Coffee tip off? Balita Boss got all of the information you will need to know to make sure you don’t miss out on any of the action. Paul Lee, the 2012 top rookie who scored game-winning lay-up, registered just 6 points in Game 1. Beau Belga and Jervy Cruz led the Rain or Shine with 15 points each. Joe Devance and Marc Pingris recorded a double-double with 17 points and 10 rebounds and 13 points and 12 rebounds to lead the San Mig Coffee. Yap scored only 12 points as he went 6-of-13 from the field. Overall, Painters made 43.6% or 34-of-78 from the field, while the Mixers did 41% or 32-of-78. The RoS also had the edge in points from 3-point range, 6-of-25, compared to SMC 1-of-11. The San Mig also missed 15 free throws out of 30, while Rain or Shine converted 9 out of 12 from the foul shots. San Mig won the rebounding battle 55-44 but committed 14 turnovers to Rain or Shine’s 12. Enjoy the game and check back in with Balita Boss throughout the day and duration of the PBA Finals as we keep you up to date with the latest news.